Having been dug up in the summer and as I actually have space, almost everything is getting protection this year. I started to move the bigger plants into the greenhouse today as I would be very upset to loose the after three years planted outside unprotected. First in were the yucca rostratas. They are totally hardy for me, but have a very annoying habit of dropping all their roots if disturbed, so are having to be re-rotted. This should in theory be easy, but it is a worrying time as if they are ever going to suffer from rot it would be now. They are two of the stars of by old dry bed, with the larger one being a perfect blue colour (not that you can tell from this early evening photo). The other one has had more shade for a lot of the time it was planted as is greener. The middle sized cycad was also brought in. It flushed over the summer, and for once I would like it to stay pristine and not have to cope with snow. The smaller one will go in another cold frame and the largest will get a fleece cover. The large agaves will mainly be in the other cold frame as it means I don't have to move them; I don't fancy having to carry them through the very narrow greenhouse door. A few more may make into here along with some more of the aloes, but ideally I want to keep space to potter in there over winter and not totally fill it. I'm not sure what all the plants that are usually left totally unprotected are going to make of this special care. They had better not get used to it, it will be a return to the tough life again as soon as the new dry bed is designed and built. Keep warm and dry big guys! I'm not sure they will be any warmer, but they will be dry which is the main thing. Good luck overwintering them...I don't envy the task of moving them in...and then out! It was fun getting them in. Thankfully the leaves are very flexible and you can brush against them without coming off badly. They will be left unil the new dry bed is ready, I'm not moving them in and out. 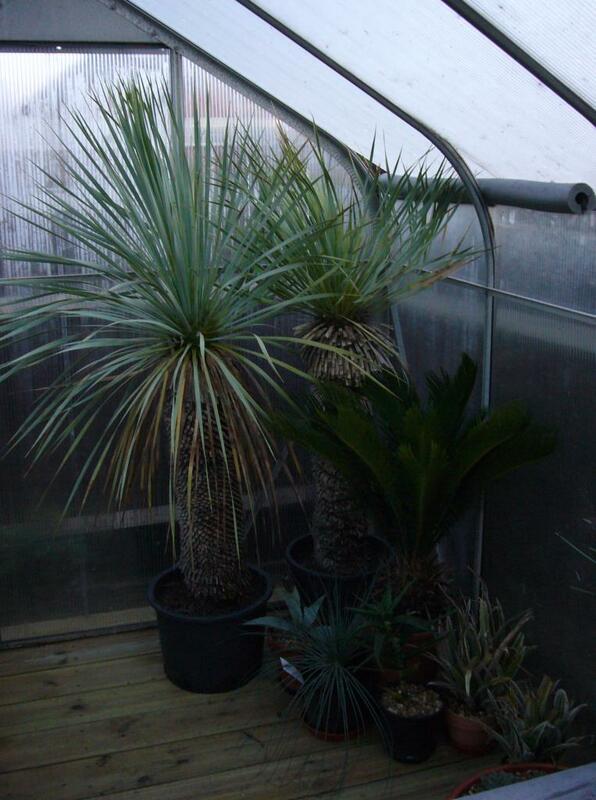 How old are your Yucca rostrata? I have one of 40cm diameter but as yet no trunk. I am not sure. I bought them 4 years ago with pretty much all the trunk. I used to believe that was the only way to get trunks, but a friend did grow one from seed and after about 7 years it now has a 1 foot trunk. Excess moisture rather than cold the problem? Your plant is very pretty--good motivation for moving it. Yes cold and wet is the big killer. 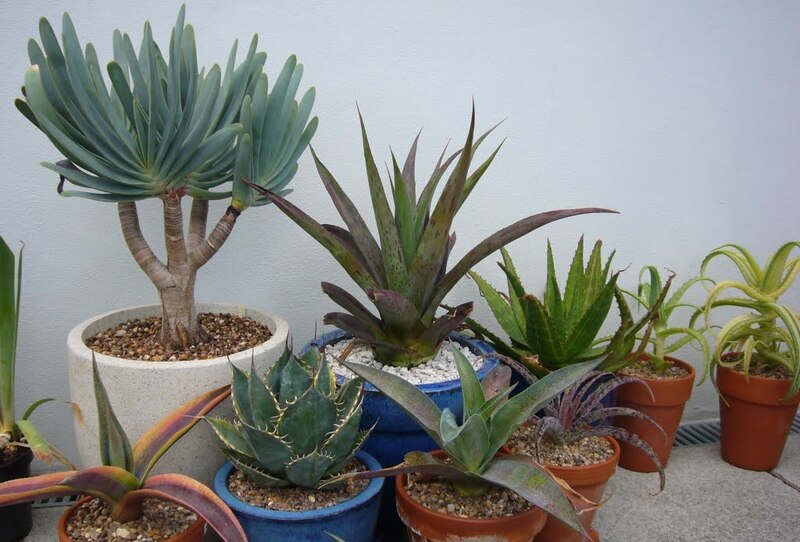 Almost all succulents will cope with lower temps if kept dry (although this is only a few degrees colder) Then when re-rooting wet again, even in summer, can do more damage than good. Not something you have a problem in where you live. Must find more time for the plants.